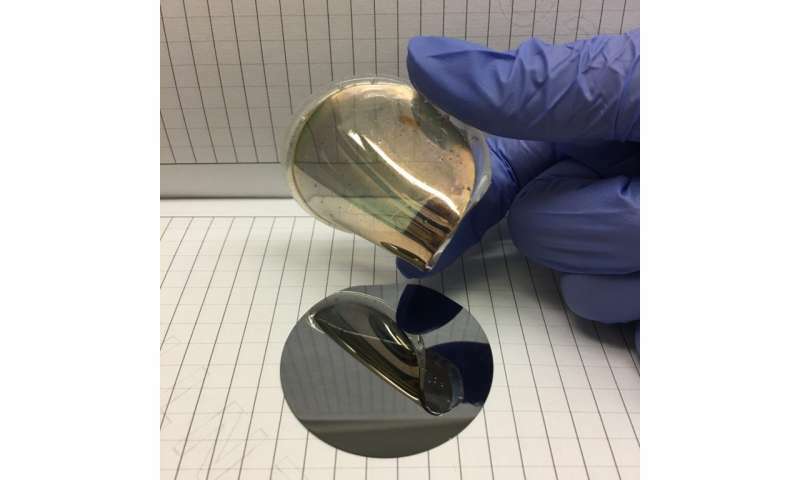 An example of a gold foil peeled from single crystal silicon. Credit: Reprinted with permission from Naveen Mahenderkar et al., Science : (2017). Writing in the March 17 issue of the journal Science, the Missouri S&T researchers say they have developed a way to "grow" thin layers of gold on single crystal wafers of silicon, remove the gold foils, and use them as substrates on which to grow other electronic materials. The research team's discovery could revolutionize wearable or "flexible" technology research, greatly improving the versatility of such electronics in the future. According to lead researcher Dr. Jay A. Switzer, the majority of research into wearable technology has been done using polymer substrates, or substrates made up of multiple crystals. "And then they put some typically organic semiconductor on there that ends up being flexible, but you lose the order that (silicon) has," says Switzer, Donald L. Castleman/FCR Endowed Professor of Discovery in Chemistry at S&T. "Say you're making a solar cell or an LED," he says. "In a semiconductor, you have electrons and you have holes, which are the opposite of electrons. They can combine at grain boundaries and give off heat. And then you end up losing the light that you get out of an LED, or the current or voltage that you might get out of a solar cell." Most electronics on the market are made of silicon because it's "relatively cheap, but also highly ordered," Switzer says. "99.99 percent of electronics are made out of silicon, and there's a reason – it works great," he says. "It's a single crystal, and the atoms are perfectly aligned. But, when you have a single crystal like that, typically, it's not flexible." By starting with single crystal silicon and growing gold foils on it, Switzer is able to keep the high order of silicon on the foil. But because the foil is gold, it's also highly durable and flexible. "We bent it 4,000 times, and basically the resistance didn't change," he says. "So we came up with this trick where we could photo-electrochemically oxidize the silicon," Switzer says. "And the gold just slides off." The research team's discovery can be considered a "happy accident." Switzer says they were looking for a cheap way to make single crystals when they discovered this process. "This is something that I think a lot of people who are interested in working with highly ordered materials like single crystals would appreciate making really easily," he says. "Besides making flexible devices, it's just going to open up a field for anybody who wants to work with single crystals."